WHERE: Show Me Center, Cape Girardeau, Missouri. 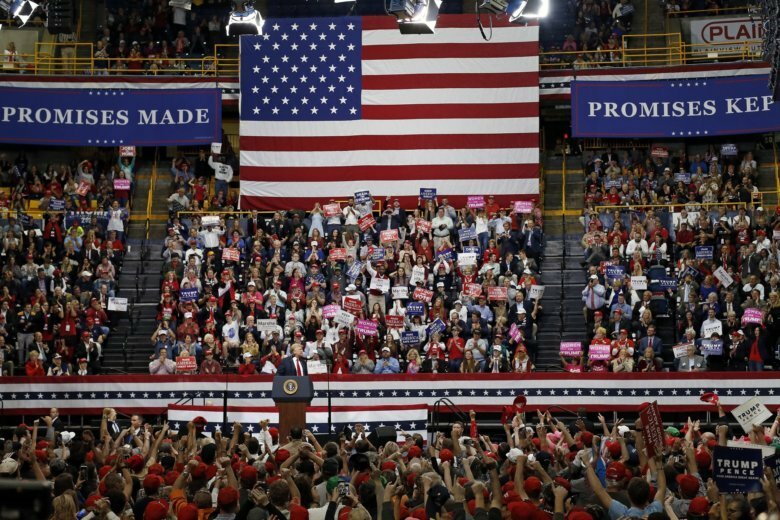 THE FINALE: President Donald Trump’s rally in Missouri was his third of the day, 11th in his final-week blitz and the last one of his 2018 midterms campaign. GUEST STARS: Trump was joined by conservative media stars, radio host Rush Limbaugh and Fox News hosts Sean Hannity and Jeanine Pirro. Some White House staffers also came on stage, including Ivanka Trump, Sarah Huckabee Sanders and Kellyane Conway. WHERE: Allen County War Memorial Coliseum, Fort Wayne, Indiana. RUNNING TIME: 1 hour, 9 minutes. THE BIG SLEEP: The president was in Indiana backing Republican Senate candidate Mike Braun, who he said is “smart, tough, he sleeps like four hours a night or less.” Meanwhile, Trump has labeled Democratic incumbent Sen. Joe Donnelly “Sleepin’ Joe.” ”Joe wakes up primarily when Schumer calls,” Trump joked, referring to Senate Minority Leader Chuck Schumer. WHERE: International Exposition Center, Cleveland. SIGN OF THE TIMES: A giant “Q” representing QAnon, a right-wing conspiracy metatheory born on the internet that few really quite understand. WHAT WAS THAT AGAIN? “You’re not allowed to use the word ‘beautiful’ anymore when you talk about women. No, no, you’re not allowed. It’s politically incorrect. I will never call a woman beautiful.” — Trump, introducing his daughter Ivanka. BIG LINE: “You don’t hear so much about that big ‘blue wave’ anymore.” — Trump. BIG LINE: “There’s electricity in the air like I haven’t seen since ’16” — President Donald Trump’s assessment of Republican enthusiasm two days out from the midterm elections. PLAYING TO THE CROWD: The crowd at the Middle Georgia Regional Airport hangar was pumped, cheering loudly and breaking into a “Six more years!” chant. Trump implored his supporters to vote, telling them: “This is a very important election. I wouldn’t say it’s as important as ’16, but it’s right up there,” he joked. Trump also raised eyebrows with a call to reject the Democratic policies and their “politics of anger and division.” Trump has been stoking fear in the last weeks of the race, warning of a near apocalypse if Democrats take power. SIGN OF THE TIMES: Lots of pink “Women for Trump” signs in the crowd. BIG LINE: “A vote for any Democrat this November is a vote to really put extreme far-left politicians in charge of Congress and to destroy your jobs, slash your incomes, undermine your safety and put illegal aliens before American citizens. Not good.” — President Donald Trump on the stakes of the midterm elections. PLAYING TO THE CROWD: In just about every campaign speech, Trump reminds audiences that he kept his campaign promise to replace the “horrible, horrible” North American Free Trade Agreement, which he said had contributed to the loss of thousands of jobs in the U.S. Trump has replaced NAFTA with a new trilateral agreement, one he calls the US-Mexico-Canada agreement, or U-S-M-C-A, for short. Even he acknowledges the acronym is a mouthful, but he told the Florida audience to just think of the one-time hit song “YMCA” by the Village People. “USMCA right? Like YMCA,” Trump said, as he proceeded to sing a little bit of “YMCA” before he moved on to his next talking point. WHERE: Bozeman Yellowstone International Airport, Belgrade, Montana. SIGN OF THE TIMES: Before Trump began speaking, a white-bearded man with a cane held up a white cloth with “Trump Lies” written on it only to have a person standing next to him knock it to the ground. The protester held up his sign twice more before a man in a suit and an earpiece snatched it from him, balled it up and walked away. TODDLER TRUMP: Jackie Poulsen of Billings dressed her 15-month-old daughter, Finley, as Trump for the rally, drawing a crowd of people with cellphones taking photos of the toddler with the tie and slicked-back hair. WHERE: Southport High School, Indianapolis. BIG LINE: “I need you to vote for a Republican House and a Republican Senate so we can continue this incredible movement, the greatest political movement in the history of our country. It is.” — Trump on what’s at stake Tuesday. WHERE: Huntington Tri-State Airport, Huntington, West Virginia. WHERE: Columbia Regional Airport, Columbia, Missouri. RUNNING TIME: 1 hour, 17 minutes. VIBE: Bundled up in warm jackets and winter hats, the crowd spilled out of an airline hangar into the crisp, dark night. Trump basked in the cheers from a stage positioned in front of the open doorway, surrounded by American flags and with Air Force One parked just behind him. BIG LINE: “The Republican agenda is the mainstream agenda of the American people — it’s how we all got here.” — Trump. VERBATIM: “We are human beings that do exist, and no matter what he says we are still here and we’re still going to fight against people who try to take away our rights.” — Oakley Peterson, 21, a film student at Stephens College in Columbia, holding a sign with the transgender flag and protesting the Trump administration’s proposal to narrowly define gender. CANDIDATE CORNER: “Claire McCaskill wanted us to call Hillary Clinton Madam President. On Nov. 6, we’re going to call Claire McCaskill fired.” — Republican Josh Hawley, seeking to unseat Democratic Sen. McCaskill. — By Catherine Lucey and Summer Ballentine. WHERE: Hertz Arena, Estero, Florida. SIGN OF THE TIMES: An Elvis impersonator! After all, it was Halloween. At least one supporter dressed as Trump. VERBATIM: “I’m gay. None of my friends are for this. So I’m here alone. I voted for Obama twice. I think he was a big lie. In the midterms, I’m going to vote the way Trump sees it.” — Allison Chiddo, 56, co-owner of a drug and alcohol rehab center in West Palm Beach. President Donald Trump is making a final midterm campaign dash featuring 11 rallies in six days. AP reporters and photographersr are capturing the scene at each stop. Find highlights here.